This recipe is based off of Laura-Jane Koers' raw chocolate torte from her cookbook, Cook Lively! The original recipe has dried apricots in the crust, as well as folded into the filling. Although I have made it exactly as Laura-Jane does, the recipe I have shared with you below has a few modifications--I think dates work a little bit better than apricots in the crust because they are more moist and help it stay together. Also, I love the combination of chocolate and raspberries, so I substituted out the apricots in the filling for fresh berries. I got so many compliments on this torte that I just had to share it with more people! Rich, chocolaty, and relatively healthy. Yes. Please! 1. Spray an 8-inch spring-form pan with non-stick spray and set aside. 2. To make the crust, place coconut, walnuts, cocoa powder, and salt into a food processor. Process into a fine meal. 3. Add dates to the food processor. Process again until the mixture is well combined. The mixture should stick together when pinched. 4. Transfer the mixture to the pan and spread it evenly over the bottom with a spoon. Using your hands or the bottom of a small measuring cup, press the mixture down firmly. Set aside. 5. To make the filling, in a large bowl, place the cocoa powder, maple syrup, coconut oil and vanilla. Using a whisk, mix vigorously until well combined and smooth. Fold in the fresh raspberries. 6. Using a spatula, scrape the filling over the prepared crust and smooth evenly. 7. Freeze for at least two hours, or until firm. Slice right from freezer. Store in freezer at all times. When serving, you can top the torte with fresh raspberries, dusted cocoa powder, toasted coconut, chopped walnuts, shaved chocolate and/or coconut whip! Enjoy! Day in and day out you see pretty pictures of the cakes I make and design for clients. I thought it would interesting to give you a few behind the scenes updates from my kitchen to give you a better idea of what really goes on over here. As most of you know, I work from home. Not my home, though. My parents have a nice and spacious kitchen with a new stove and lots of counter space. Plus, there is lots of storage here too, for all of my cake-making supplies--pans, ingredients, sprinkles, you name it. Having such a great space to work in has really made it possible for me to grow my business. Since I work on my own, what has also helped me and has made things SO MUCH easier is having two Kitchenaid stand-mixers. I don't know how I ever survived without these babies. They really save me so much time and help with multi-taking when I have lots to do. They also make the fluffiest buttercream icing--I can't even imagine making frosting with a hand-held mixer now. I've been trying for months to make the perfect French macaron. A couple months ago I used an entire bag of almond flour from Costco attempting to make them and it was a huge mess! I didn't realize how tricky they are to master--from making the perfect meringue, to the precise measurements, to the mixing, also known as "macaronage," to the baking. I gave up. Two weeks ago I thought I would give it another go. Clients keep requesting them for their cakes and I've also had people ask to buy them by the dozen. I've always had to outsource them or decline requests. Well, not anymore! I FINALLY had success this time around (after 4 attempts over the last week and a half in addition to my previous tries). I am happy to say that I am now offering them in my new online shop. I even registered for a class at Le Detroit Macaron in Michigan to help me because I was having so much trouble. I'm still going to the class because this little shop is amazing. Over the last 6 months or so things have really picked up. I'm fully booked almost every weekend and I'm having so much fun. As you may or may not know, I do have a full-time job, so I try to run my cake business on the side for now. It's a lot of hard work and long nights, but when you're doing something you love it makes it worth it! I remember when I first started the business a little over a year ago I was only making orders for friends. I would check my business email everyday, but I would find it empty (so sad, I know). I can't even explain the excitement I had when my very first client placed an order. She ordered cinnamon buns and I was so excited that someone who I didn't know wanted to try my product. At this time, I was selling a wider variety of food products--bagels, cinnamon buns, pies, etc. I've really refined things since then, sticking to what I enjoy most and what I'm best at--cakes (mostly)! Thank you to everyone who has supported my little cake business since its inception and to all my new clients who allow me to express my creativity everyday. Who knows what the future holds! I really try to bring my creativity and passion into all aspects of my business. I've been experimenting with some new flavours lately and have added a few as options on my website. There's something about unusual and unique flavours that really intrigue me. I don't know if it's the fun of testing things out, if it's the unknown that motivates me to figure out what tastes good, or if it's just the fact that I get bored easily and want to keep myself stimulated. Probably a little bit of everything. One of my favourite ways to incorporate new and exciting flavours is through buttercream--you can very easily steep flavours into the butter before you whip it to create buttercream with a punch! I usually make buttercream with two cups of butter (plus icing sugar, salt, vanilla, and milk). Before you put your butter into the bowl of a stand mixer, take one of the two cups and put it in a pot with something that steeps easily--earl grey tea, lavender buds, etc. Bring it to a boil, take it off the heat, and let it sit for 15 minutes at room temperature. Then strain it into a separate bowl and pop it in the fridge until it becomes the consistency of room temperature butter. Then all you have to do it throw it in the bowl with the rest of the regular butter and make your buttercream how you normally would from there! 1. Preheat oven to 350F. Grease and flour a large bundt pan. 2. In a small bowl, sift together the dry ingredients--flour, spices, salt, cocoa powder, baking powder and baking soda. 3. In a large bowl, whisk together the wet ingredients, starting with the almond milk and vinegar, then adding in the aquafaba, oil, molasses and maple syrup. Add the dark brown sugar and granulated sugar until well combined. 4. Fold the dry ingredients into the wet ingredients a little at a time and mix until just incorporated. 5. Pour batter into bundt pan and bake for approximately 50 minutes, or until a toothpick comes out of the center clean when tested. Baking times vary on ovens. 6. Let the cake cool completely in the pan before turning it out onto a wire rack. 1. Combine the coconut milk, brown sugar and salt in a saucepan over medium-high heat. 2. Bring to a boil, then lower the temperature to simmer. 3. Simmer for approximately 30 minutes, stirring occasionally. Once the sauce has turned a dark amber colour and can coat the back of a spoon, remove from the heat. 4. Add in the vanilla extract and cardamom. *Sauce will thicken as it cools to room temperature and even more when stored in the fridge. This post is all about creativity. I wanted to share some of the super popular cake trends going around right now. I've put together a little visual list of my favourites below! Marble cake are so popular right now! This painterly look is right up my alley. Love! 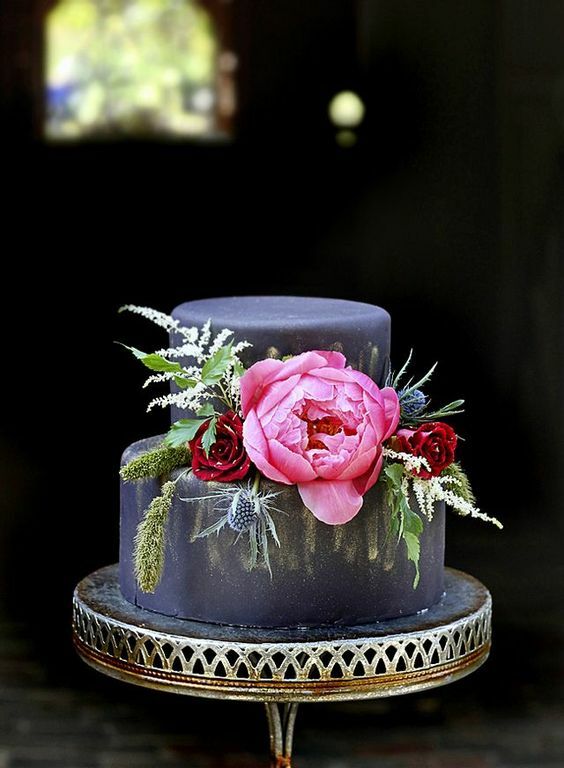 I really love the contrast of the black fondant covered cake. Especially with vibrant florals! I absolutely love the geometric cake with the gold and fruit. So pretty! Everyone is familiar with the naked/semi-naked look. It pairs so well with fresh florals! I love the look of this cake and the fact that you can see the brush strokes! I can't believe it's almost Christmas. Again. I have somewhat of a love/hate relationship with this time of year. The good? Warm drinks, family gatherings, delicious baked goods, Christmas trees and my birthday! The bad? I'm not a fan of the the cold. I only like to see snow falling on Christmas Eve, Christmas Day and New Years Eve. Once December has past, I've pretty much had it with the winter. Lets not focus on the negative! This post is all about the positive--Christmas favourites! And I mea, Christmas baked goods, of course. I have compiled a little list below of my all time favourite holiday goodies that help to remind me of all the good things happening this time of year. I know what you're thinking... boring. Just like sugar cookies, shortbread cookies are somewhat overrated, but, they're a classic, especially for Christmas! When I was young, my mom would make dozens of her famous shortbread cookies and I couldn't get enough. We would top them with green and red sugar sprinkles and they were always baked to perfection. Just the right balance of crumbly meets melt-in-your-mouth. She would make so many that we were eating them well into February and March. I never complained. Sadly, she doesn't make them much anymore, but I'm thinking I may need to dig up her recipe and give them a shot this year! Panetone also reminds me of my grandma. She's been making panetone for as long as I can remember and she always puts a mini one in our Christmas gift bags every year. They are moist and fluffy with a hint of citrus and raisins. Obviously the best right out of the oven. Believe it or not, I actually love the store bought panetone, too! (The right brand, of course). There's something about the flavour that I just love. Not to mention, it stays chewy and fresh for so long. I haven't tried making panetone on my own, but it's definitely something I've been meaning to try. Now that I think about it, I should ask my grandma for a lesson! Whether it's gingerbread cookies, gingerbread loaf or gingerbread cake, I love it. I'm a huge fan of the flavor combination of molasses with all of the wintery spices--cinnamon, ginger, cloves, nutmeg, all spice, cardamom. There's just something about gingerbread that screams Christmas. Gingerbread is to winter what pumpkin is to fall. Definitely. This one sounds a bit vague, but I am thinking of a very specific cookie. The cookie is made up of two pieces of cookie dough--one red, one white--that are twisted together and formed into the shape of a candy-cane. Every year around Christmas time, my old neighbor would bring over a tin of her homemade cookies. My brother and I would fight over these candy-canes. We didn't care about anything else in the tin. I don't know why we never tried to make them ourselves. We should have asked our neighbor for the recipe. Unfortunately, she moved last year, so it looks like we have no choice but to make them if we want to get out fix this Christmas! I have compiled a list below of my five favourite flavours for fall. Whether these flavours are used in cakes and baked goods, for something hearty, or in warm beverage, they are tasty! Unfortunately, the weather is not cooperating this year and it still feels like summer outside. However, I am going to write this post anyway because fall is my absolute favourite season and it's already the end of September. The best thing about fall, besides the fresh air, leaves, and Thanksgiving dinner, is the in-season produce! Pumpkin! Squash! Apples! Yum. I just baked a vegan pumpkin pie cake and I can't wait to ice and serve it. It's a hearty two-layered pumpkin spice cake made with brown sugar. I'm going to ice it with vanilla "buttercream" and add a twist--graham cracker crumbs! There's no way this cake can be anything but amazing. Pumpkin also reminds me of when I used to live in Toronto--I would buy the pumpkin loaf from The Abbott Coffee Shop everyday. No joke! There's nothing like a warm chai latte on a crisp autumn morning. Cardamom, cinnamon, nutmeg, cloves and ginger. All my favourite spices. I recently developed a chai latte cupcake recipe that is to die for! And to top it off, literally (lol), I add cinnamon vanilla frosting. Yum. I recently came across a recipe that even my dad loves, and I don't hear that too often. It's a sweet potato chocolate layer cake with molasses buttercream. I add caramel to the mix, too! Just for a little something extra. Check out the recipe here. There's so much you can do with apples--sweet or savory! My aunt makes one of my favourite Thanksgiving dishes. It's a sweet potato bake with fresh apples, red onions and oregano. It's super simple to make and I look forward to eating it every October! For your sweet tooth--apple pie is a must and I have been making a vegan deep dish apple pie crumble over and over again for the Green Bean the last couple weeks. You can never go wrong with homemade apple butter either, especially if you've just gone apple picking and are looking for something to make with your big haul! I know you can get pears in the summer and in the winter, but they go so well with all of my favourite fall spices, specifically cardamom and ginger. I love a hearty pear coffee cake early in the morning with a hot tea. Pears also go well with cinnamon, walnuts and molasses! Not to mention, maple syrup mixed into a scone recipe with pears is to die for! I came across this article on Huffington Post by Food52 that inspired me to do one of my favourite things--make a list! Click here to read the "14 Essential Baked Goods Every Baker Should Master." It made me think about all the struggles that I've had in the kitchen since starting my own business. I have decided to write this blog post. I came up with a list that includes all of the baked goods and desserts that I have yet to master myself, some of which are found in the article and others that just drive me nuts! I haven't actually attempted to make angel food cake yet, but I am a little intimidated considering it's one of my Nonna's classics. I don't think it's going to be too difficult, but it's all about getting that fluffy airy texture. I think this one is on the list because it's such a classic. This is my dad's favourite and it's a coincidence that it's on the list because I was going to make it for him this weekend for Father's Day. I better get mastering this one or else Angelo won't be too pleased. I don't think banana bread is difficult to make. In my opinions, it's all about preference. Some people like basic banana bread while others like loaded banana bread--nuts, chocolate chips, streusel topping. The works. I suppose if you master the basic recipe, you can go anywhere from there! Ok, brownies are a must-master, but they're also hard to get right. Everyone hopes for a chewy, fudgey brownie that's gooey on the inside and a little crispy on the top. It's actually pretty difficult to achieve that result! I still need some practice, but I am determined. There's nothing better than a warm brownie with ice cream. This one isn't on the Food52 list, but it definitely should be. French macaroons are tricky little buggers. Every step can really mess up your recipe if it's not done correctly. Trust me, I found out the hard way. I honestly tried 8 times before I got a result that I was happy with. And then I ate the entire batch to celebrate. Yay! What desserts have you yet to master, want to try and master, or feel like you just can't master?! A cake made fresh always beats a manufactured cake hands down. Who knows what they put in those cupcakes at the grocery store anyway! If it's mass produced, you have to be a little bit weary. When you order from a local baker (like me! ^_^) you are always getting better ingredients, a fresher cake with a longer shelf life, and the option to choose from a variety of flavours. Custom-made cakes are so much more than just writing the name of someone on top of a cake. Custom-made cakes are just that--they are custom. They're not made for just anyone and usually no two are exactly the same. Cakes can be themed according to hobbies and interests, different colours and accents, and can include florals and other special decorations. The sky is the limit! Cakes create memories and are part of important events and occasions. The custom-made cake that you order for your next party will be the center of attention and your guests will be impressed. You want people to be talking about how amazing the cake was, not leaving the party trying to forget it. Yes, custom-made cakes are more expensive, but they are worth it. Grocery store cakes are cheaper, this is true, but they don't represent value since they are mass-produced with artificial ingredients. Custom-made cakes take a lot of time and attention to detail, but they are worth it because the outcome is something delicious, special, and one of a kind! When you order a custom-made cake, you know that someone has spent a considerable amount of time planning and working hard on it. A personalized handcrafted cake, for a few hours before it’s eaten, is a work of art! So next time you’re tempted to stop at the grocery store, think about the person you are buying for, or the party you are organizing and remember these tips! A little time and effort and your guests will enjoy a cake that tastes really good, is personalized, grabs everyone's attention and is made with love! If you are interested in placing an order for your own Mother's Day cake click here! I'm still working on my cake decorating techniques and I am excited to try out some of the ideas below--I have put together a small list of some of my favourite designs and trends happening right now: piped florals, macaroons, naked layer cakes. If you're interested in making your own cake for your mama The Cake Blog is one of my favourite sites! It has everything you need to bake and assemble the perfect cake: recipes, tutorials and inspirational ideas. However, don't feel bad if you don't have time, aren't very creative or just don't like to bake. That's what I'm here for! 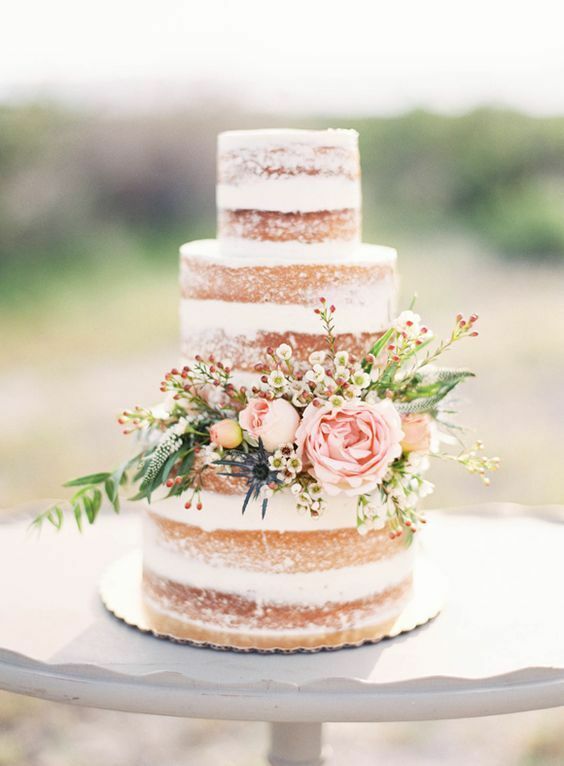 Simple + elegant cake with cherry blossoms + macaroons. We will be there every other Saturday from 8:00 a.m. to 1:00 p.m. starting on May 27th. I'm still putting together a list of potential market items. Sneak peaks include: cinnamon buns, morning glory muffins, and a variety of bagels. All of which are perfect for any Saturday morning. Sadly, I have never been to the DWFM. Although this is super disappointing, especially as a Windsorite, it makes me even more excited to be involved. Not only will I be a vendor, but I will also be a customer! Stay tuned for the full Farmer's Market menu. Coming soon! Visit the DWFM Facebook here. Check out a list of vendors here. Our Easter menu is finally here and, in addition to these little cuties below, it includes lots of yummy and festive treats to choose from! Place your order now for Easter weekend by clicking here! These are our classic vanilla bean cupcakes topped with fresh strawberry buttercream, sugar nests, and M&M chocolate mini eggs. Wowza!